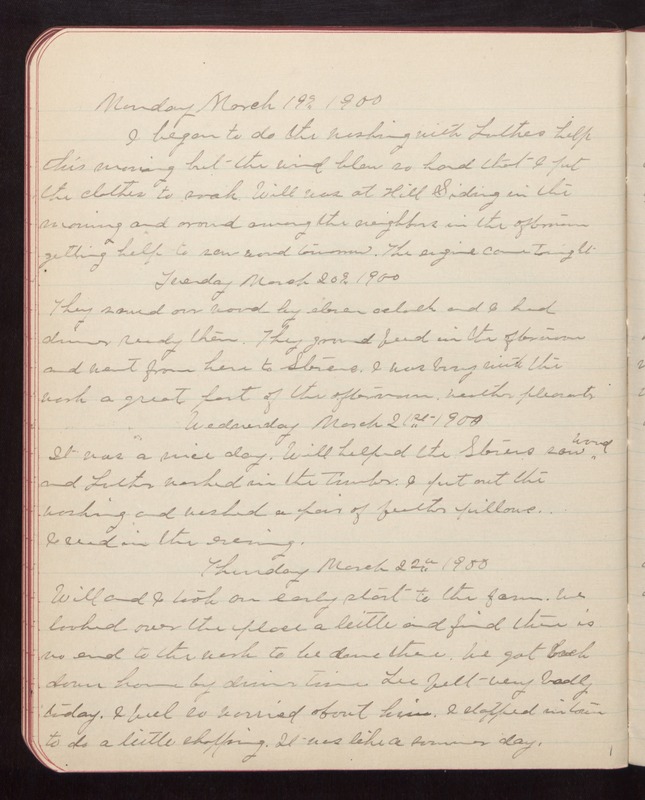 Monday March 19th 1900 I began to do the washing with Luthers help this morning but the wind blew so hard that I put the clothes to soak. Will was at Hill Siding in the morning and around among the neighbors in the afternoon getting help to saw wood tomorrow. The engine came tonight Tuesday March 20th 1900 They sawed our wood by eleven oclock and I had dinner ready then. They ground feed in the afternoon and went from here to Stevens. I was busy with the work a great part of the afternoon. Weather pleasanter Wednesday March 21st 1900 It was a nice day. Will helped the Stevens saw wood and Luther worked in the timber. I put out the washing and washed a pair of feather pillows. I read in the evening. Thursday March 22nd 1900 Will and I took an early start to the farm. We looked over the place a little and find there is no end to the work to be done there. We got back down home by dinner time. Lee felt very badly today. I feel so worried about him. I stopped in town to do a little shopping. It was like a summer day.